Another week, another new mascara launch. There are so many mascara launches that it boggles my brain, but I’m quite a picky old customer when it comes to my lash-lengthening products, so I don’t often post about them. Either the wand is too brittle or the formula is too runny, dries too quickly, makes my lashes hard and plasticky… I’d say that out of every ten or fifteen mascaras that I try, only one ever pleases me. 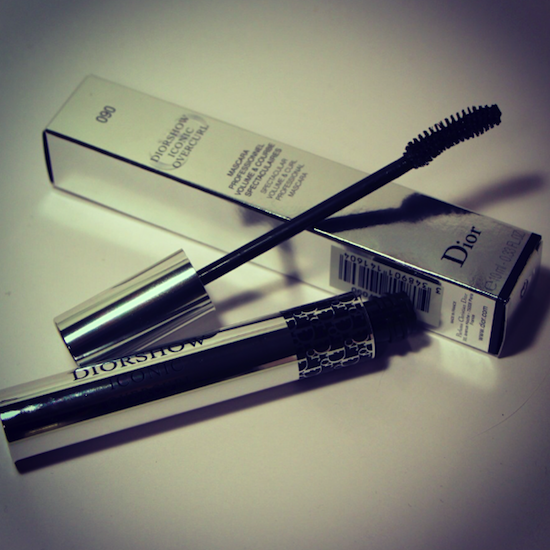 Luckily for Dior’s latest launch, the Iconic Overcurl Mascara, the time was obviously nigh for me to be pleased! I’d just chucked over ten mascaras in the bin (and posted five to my sister) because they had either dried up from long-term neglect (bad sign) or annoyed me in some little way. Dior’s Overcurl doesn’t annoy me in any way, big or small. The wand is just right – flexible but not floppy; the bristles are the perfect length and thickness for catching all of my lashes, even the tiny ones, and the brush is very slightly curved to fit the shape of the eyelid. The mascara isn’t too liquidy or too gloopy, it is, in the words of Goldilocks herself, just right. (Did she actually say that or was it the narrator? I can’t remember.) Here’s a picture of my eyes – the left eye (obviously) has mascara on it, just one hefty coat. Like it? I think it’s just brilliant! Real volume, not too much ridiculous length and a nice build-up of thickness at the root. No clumping (although you do need a lash comb if you’re going to pile the layers on) and no bits dropping down. Most importantly, no weird plastisizing of the lashes (my technical word for when the mascara seems to laminate your eyelashes in a plastic coating) which means that it’s pretty easy to take off at the end of the day. I have this mascara in black, but I have just seen that it comes in BLUE! I have a bit of a thing about blue mascaras, I have no idea why. It’s like I’m stuck in the eighties. I’m still using my Sumptuous Extreme one from last year – it could even be the year before, I don’t know. I tend to keep my makeup until it grows legs and walks on out. Dior’s Overcurl is a great addition to their range, I think – I like it about ten times more than the New Look and I liked that one a lot. It goes straight onto my It List, which you’ll be seeing appear on site very soon. The Overcurl costs £23 and you can get it at your local counter or, if you want to shop online, FeelUnique have it with free delivery.